Please take a few minutes to read through these important fishing regulations and guidelines before you go out on the lake. 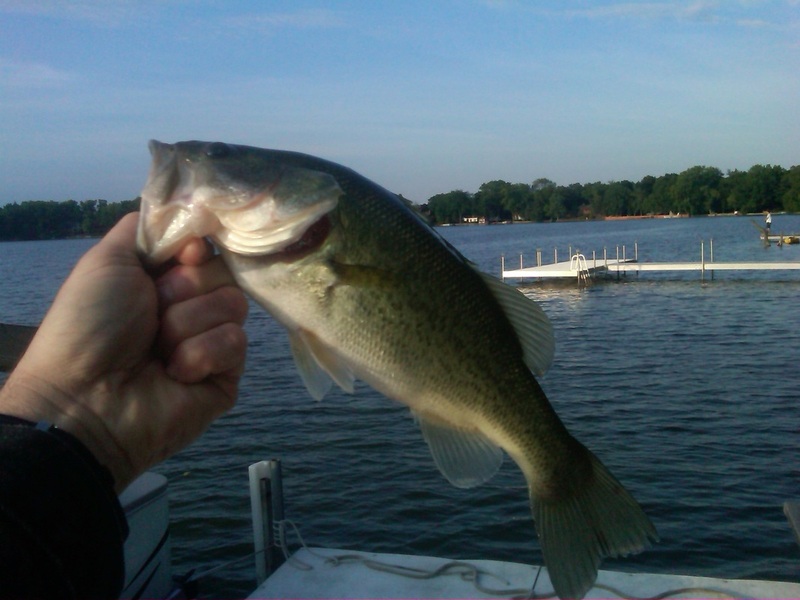 Many fish are stocked in our lake each year by your board via our residents dues. Some fish species will not reproduce naturally on our lake so certain limits and length have been established to ensure a balance fishery for years to come. Click here to view the regulations. For a small wallet size or tackle box size version click here. A fishing creel survey form has been created to help our Sustainable Lake Committee better understand our fish population and to determine future fish stocking requirements. This form is very simple and easy to use. So the next time you go out fishing print out a copy of the form and bring it with you and record your catch. Then email the excel form to us at hlcommunitysite@gmail.com. 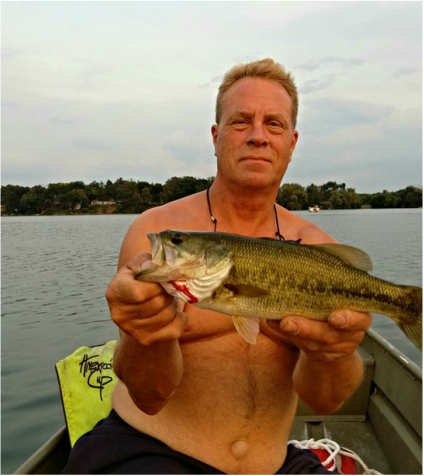 This is a very important process in managing the lake and is something that every angler can do to help and improve our lake for the years to come. 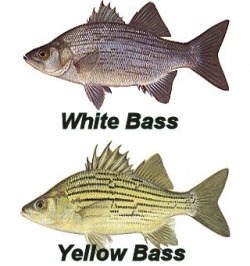 Carp and Both Yellow & White bass are present in our lake. We want to make sure that these species populations are kept in check to ensure a healthy and balanced fishery, do your part and practice "Catch and Cook" when ever possible. Is a good fish food when prepared correctly. Look for some awesome recipes coming soon. Good garden fertilizer if you don't like fish. Both fish are great to eat in our clean lake. Taste is similar to crappie or blue gill. 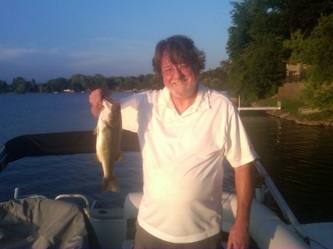 John Svec with this morning bass. He said second cast off my pier with a Rapala. Could have added this fine Bass to my growing freezer stash but I set it free. 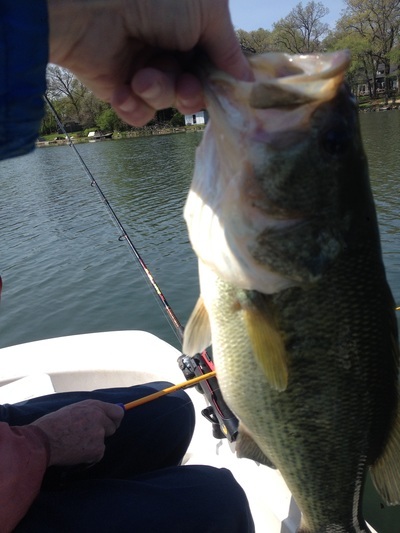 Gary Secrest getting wacky with a foot size largemouth bass. Don Roberts with a nice 18 inch walleye and a 37 inch northern pike release. 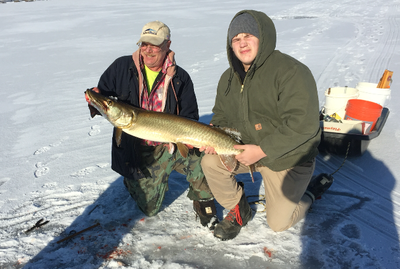 Marc Rosemeyer with a nice 36 inch musky caught on a tip up. Great release Marc. Guest Andy Loria with some nice eaters! Guest Karl Heidike with a 35 inch Water Wolf. "My that's a big one"! This was released and caught on a secret bait. 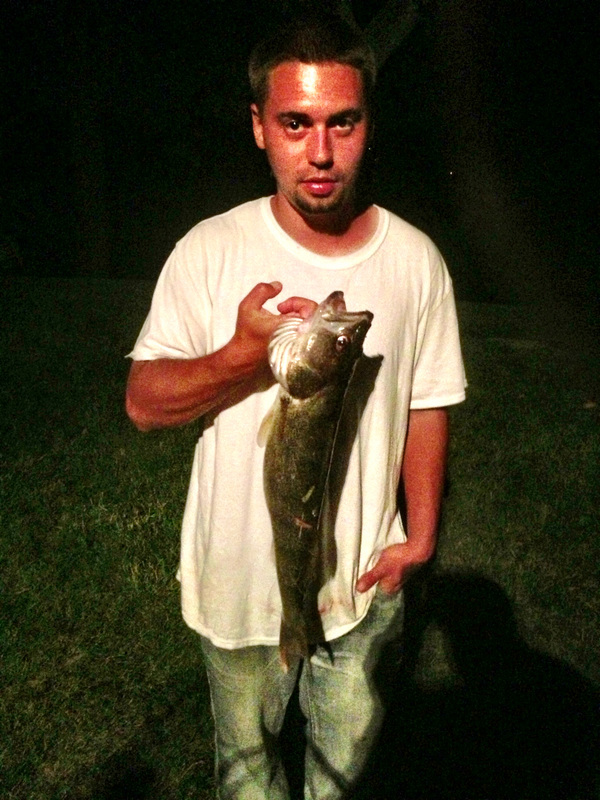 John Svec with a couple nice walleye destine for the frying pan. 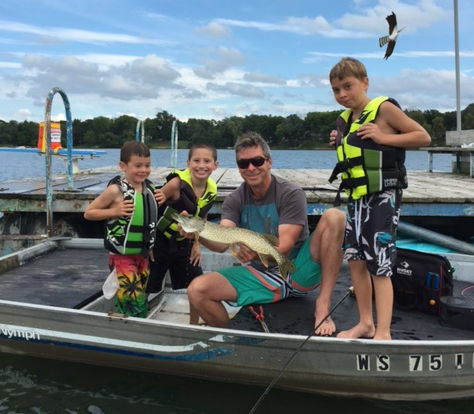 The Murphy's with a nice healthy Northern Pike released to fight another day. 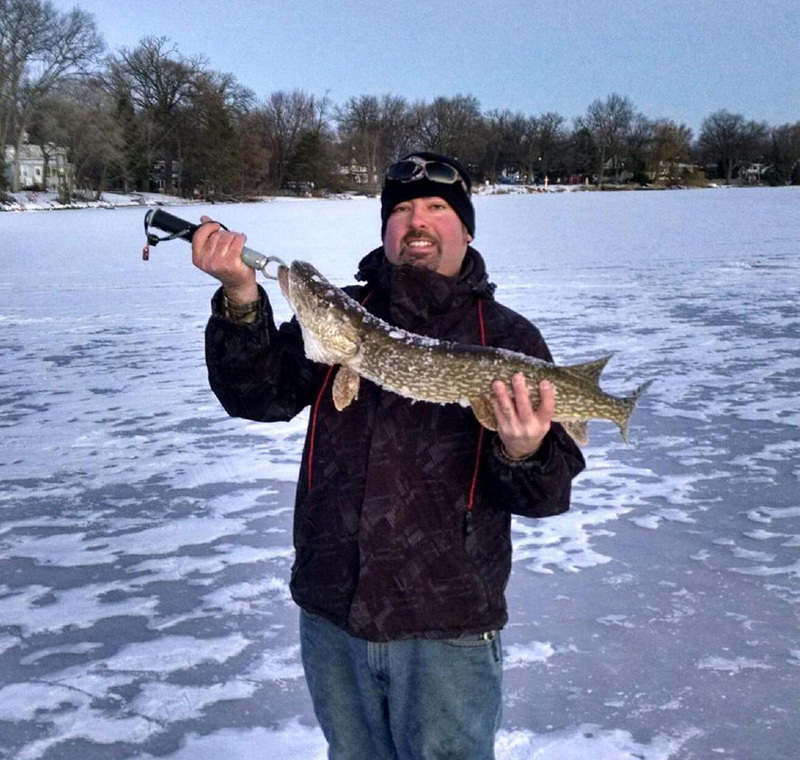 Ron Jensen with a nice wacky worm bass after a mild cold front. 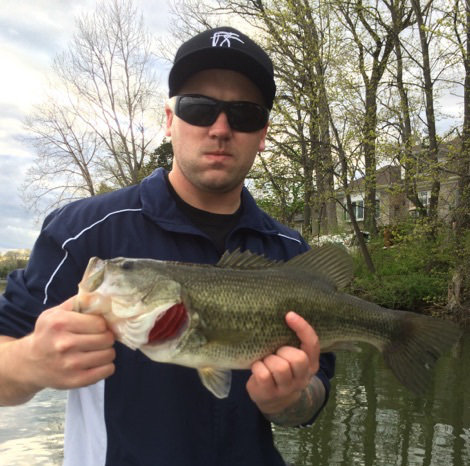 Christopher Secrest caught this nice bass on a wacky worm and released it. His dad Brian had to hold it for him. He was afraid to touch it. 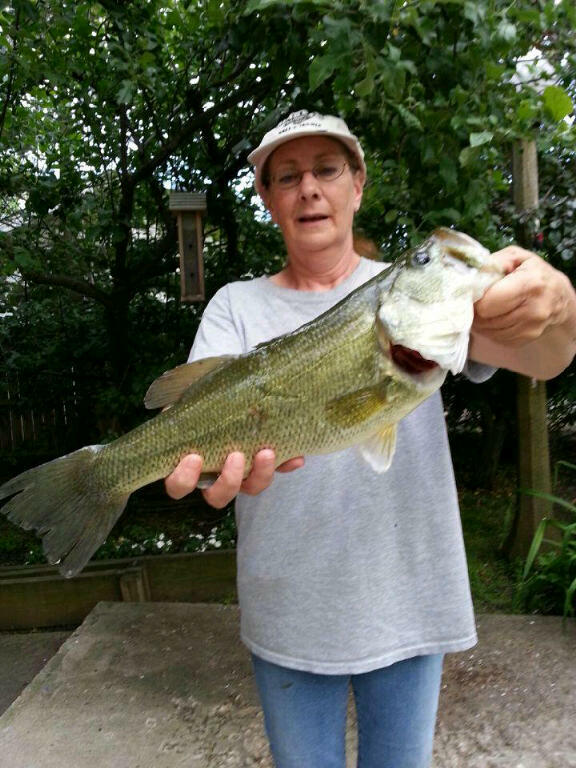 John Svec and his mother Liz, caught some nice bass as well. Looked like some real quality fish. Karl Heidecke a guest of Bob Smith caught this nice 18 inch largemouth and Bob got a 16 incher. 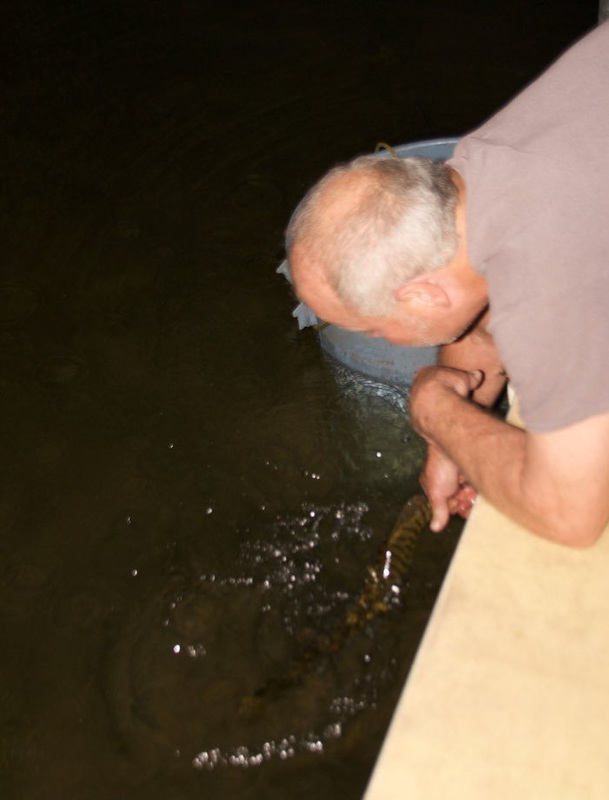 Both fish were released. 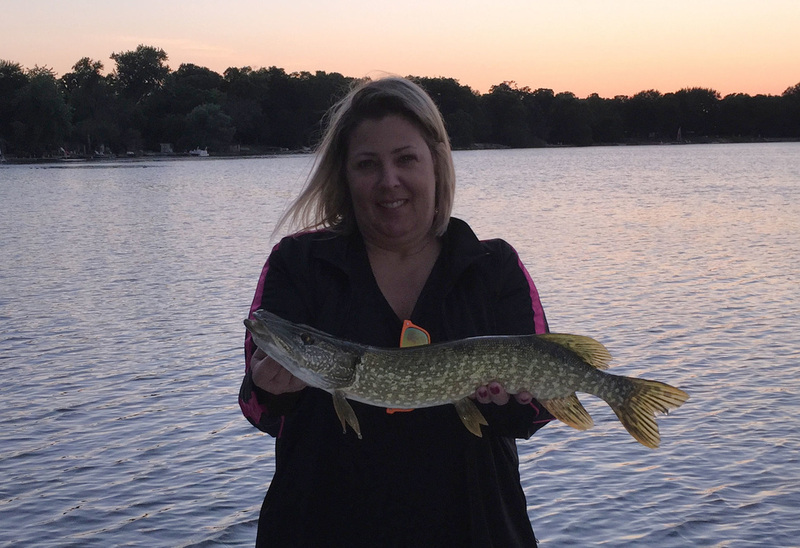 Sherrie Jensen caught this nice hard fighting pike from a neighbors pier on a popper. 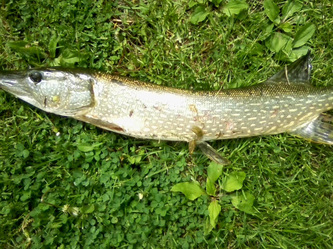 It was her first Northern Pike caught since fishing in Canada a number of years ago. This fish was released. 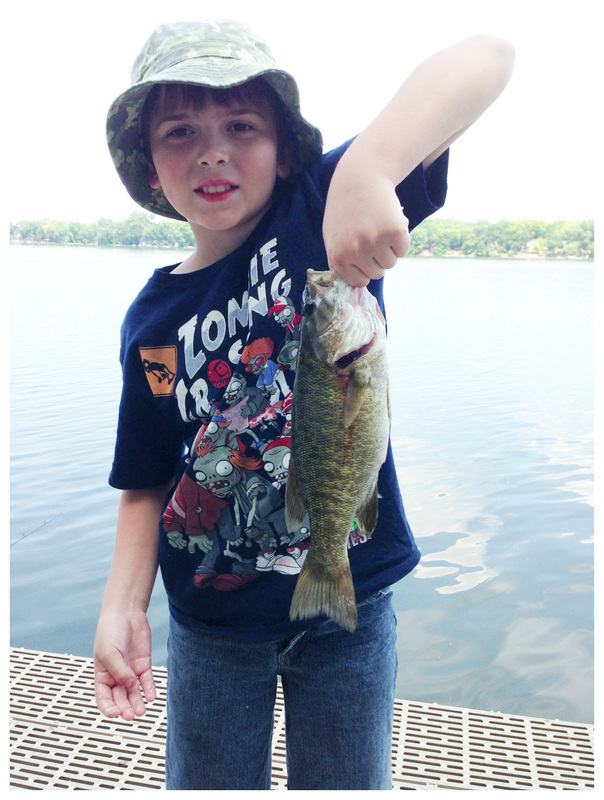 Eli Yeagley Tom Prusha's grandson with some nice bass. He lives in Colorado and said he caught his biggest bass on Highland Lake. He worked the Zara Spook walking the dog and killed them on the wacky worm. All fish were released. 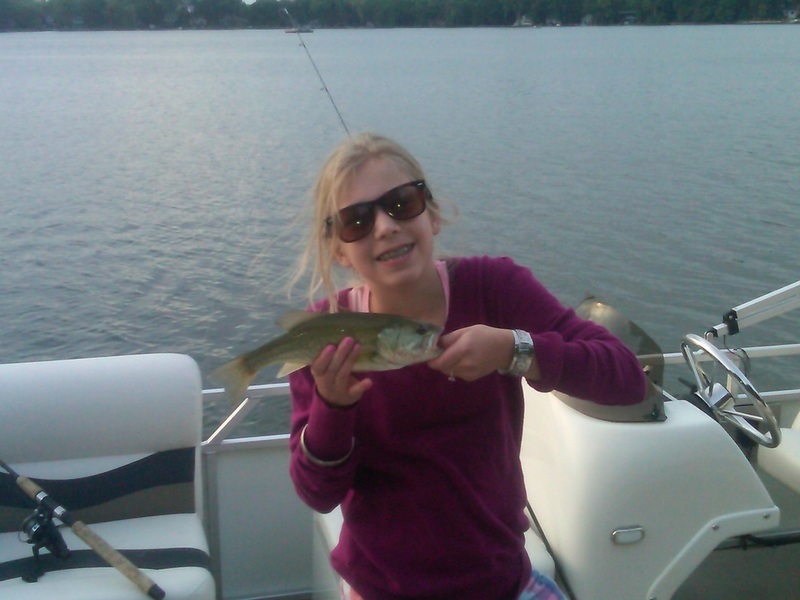 Maggie Jensen has learned how to throw a bait caster reel and the big musky baits to go with it. She's had some hits but nothing landed. This small musky was caught on a 7 inch Bucher tail over weed cover. 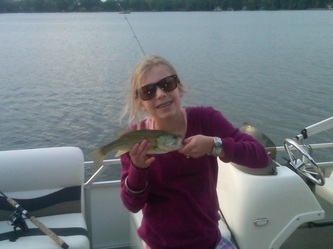 This was her first of many more musky. Most importantly this fish was released so it can get trophy size in the future. 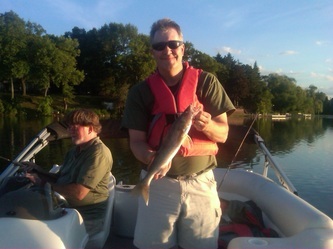 Jimmy Fraus, Gary Secrest caught fishing fever one June night. 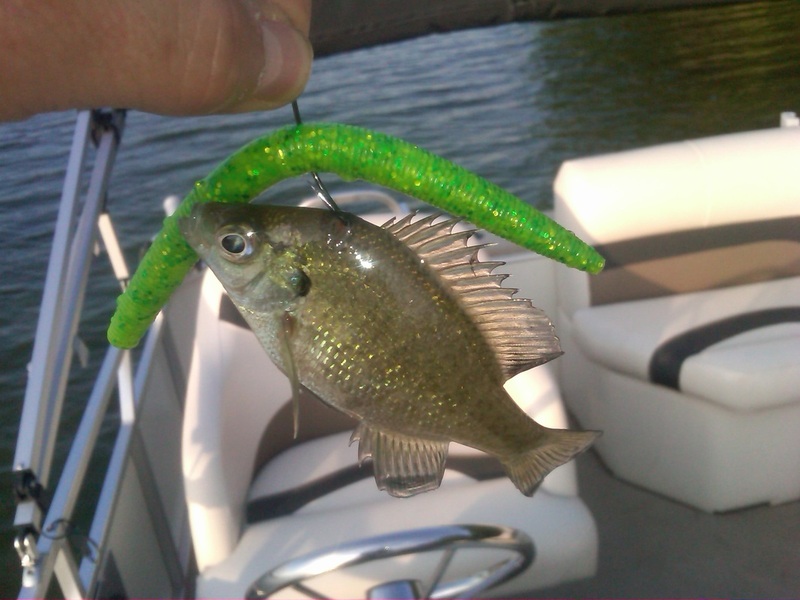 Catching 2 smallmouth and 1 largemouth bass in about 15 minutes on the wacky worm. He out fished everyone. All the fish were released. 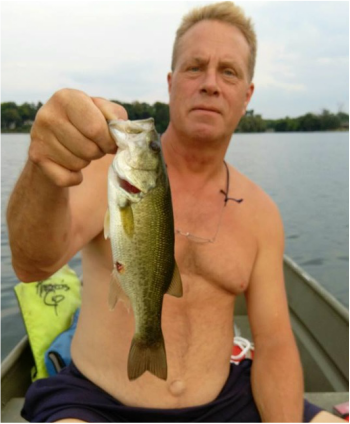 Marc Rosemeyer caught a ton of bass on his popper in June however he got careless when trying to remove the hooks from this small musky. When grabbing the fish we got one hook in his finger and the other in his forearm. Also the fish was connected to him with the lure for awhile. The fish was released after the mayhem. Bob Smith please take note. 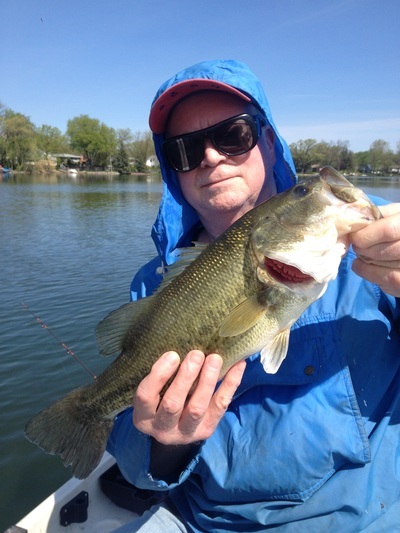 Gary Secrest with a nice large mouth on a wacky worm. His flower child shirt must have attached him to his bait. This fish was released. Keith Graham and his dad caught 10 different bass right in front of the tunnel within 7 minutes. They were all different fish too. All off a green wacky worm. We couldn't even take the pictures to prove it, because every cast. Wham. The biggest was 3.3lbs by my dad Heath. 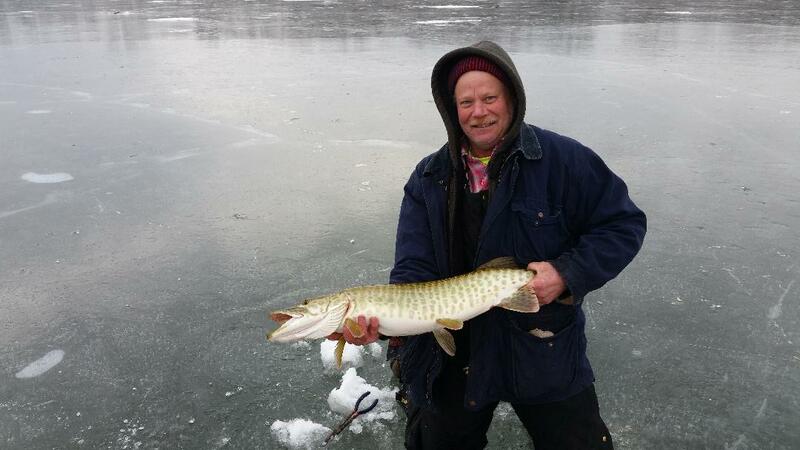 Bob Smiths friend got this nice 39 inch Musky during his lunch time break at Chic Park. The fish have to eat lunch too. This fish was released to fight another day. Bob Smiths friend Don King caught this 17 inch large mouth on May 8th. He released the fish to fight another day. 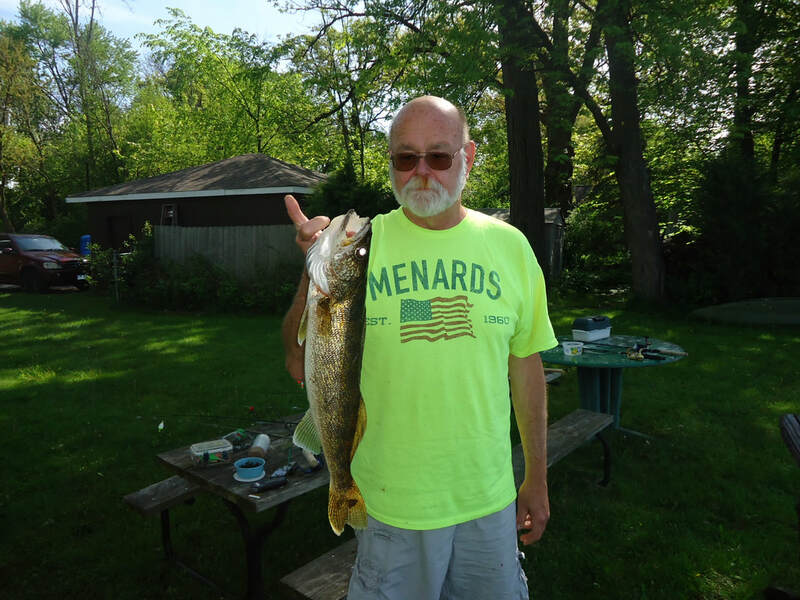 Bob Smith caught this nice 1/2 pan fish while enjoying a cold one at Chic Park. This one I think hit the frying pan. Kevin Graham had some good luck with the bass on the shores one evening early May. All were caught with a 3-4" jerk baits really shallow. They ranged 3 and 4 lbs. 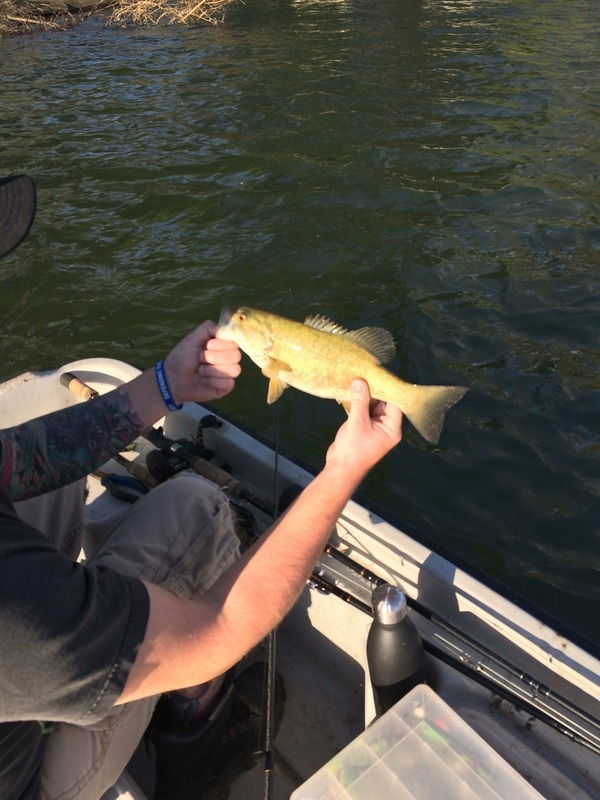 The coolest part was the little small mouth my brother hooked up with. Gorgeous gold color big eyes and such a small mouth. All fish were released to grow bigger. Kevin Graham a guest of Alex Frank picked this guy (small mouth bass) up on the south side of the lake on 3/11 off a shallow boat dock. This fish was released to fight another day. Kevin is a small mouth killer. 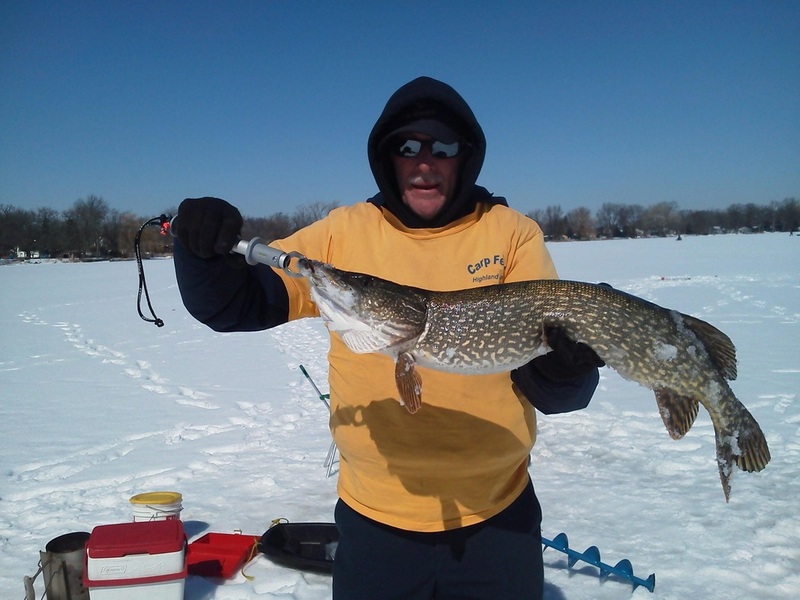 Karl Heidecke a guest of Bob Smith caught this nice 22 inch eater walleye on Super Bowl Sunday. He said he's going to Disney after his dinner. 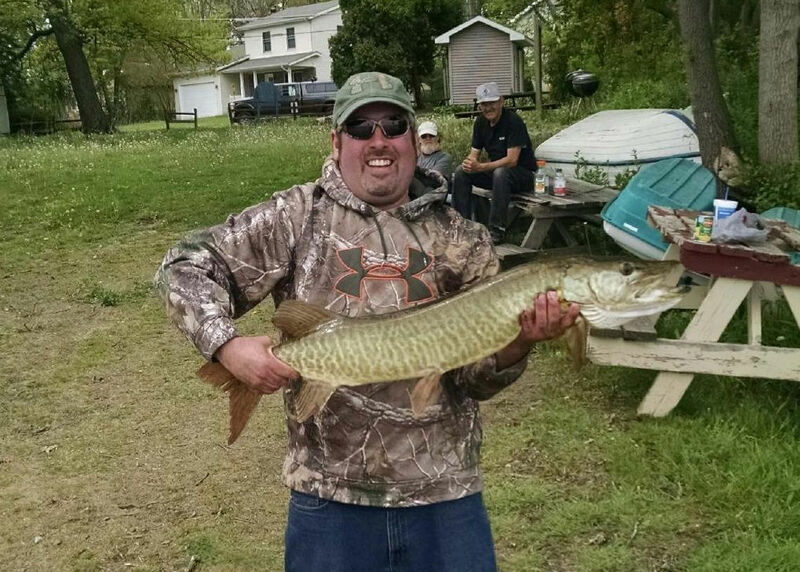 Marc Rosemeyer landed this dandy 48 inch musky about one week after his brothers monster fish. 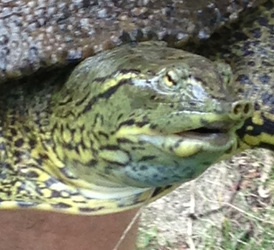 This fish was release after his photo op. 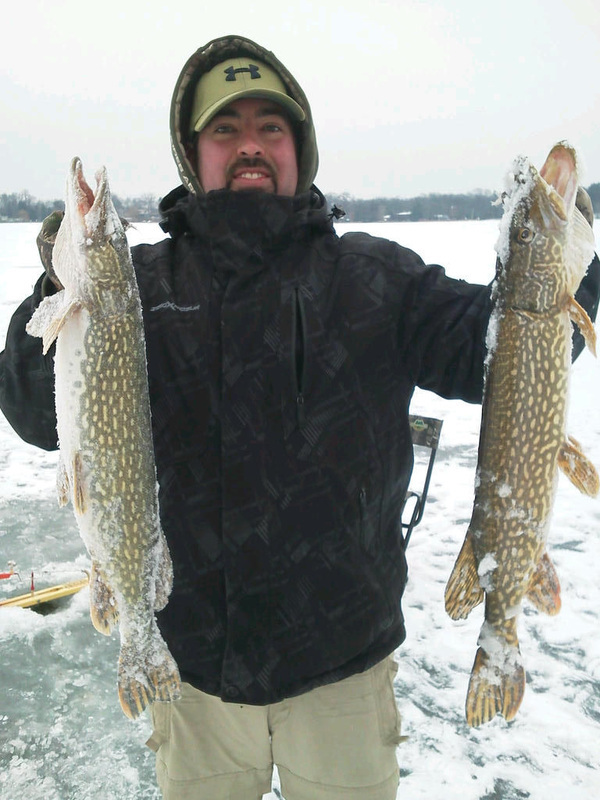 Karl Heidecke a guest of Bob Smith caught these two northern pike during braving the cold. 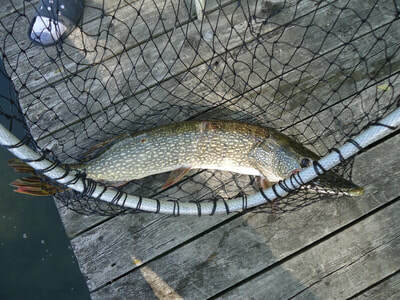 On the day the small pike on the left was caught and released the outside temperature was 0 to 3 above that day. 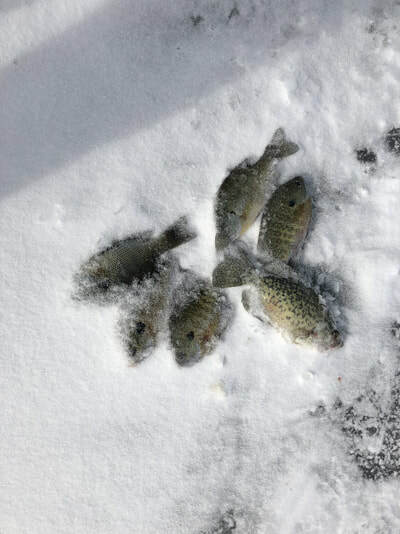 Dan Rosemeyer went out for a leisure day of ice fishing on a warmer than normal January afternoon. After about an hour later his tip up flag was up and after a fifteen minute fight, many cuts on his hands, him and his brother Marc was able to get this fish out of the hole. 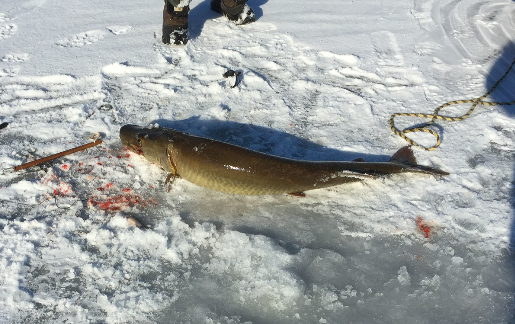 The fish was a 52 inch barred musky that weighed in at 34.4 lbs. This fish was 4.5 lbs shy of the Illinois State record. Dan intended on releasing this fish and having a replica mount produced by Marc, who is a taxidermist. 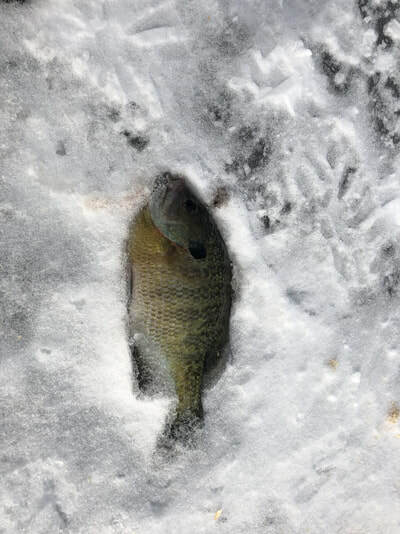 However they reported that the fish was gut hooked and a lot of blood was lost and evident in the ice hole and on the ice. They wanted to release the fish (which is in their DNA as anglers) but determined the fish would likely die if released and had to take the fish from the lake. Congratulations to Dan on catching his biggest musky ever! Remember when all possible the Highland Lake fishing guidelines state that any musky are catch and release only and none are to be taken regardless of it size. Very few musky have been stocked over the years on our lake. 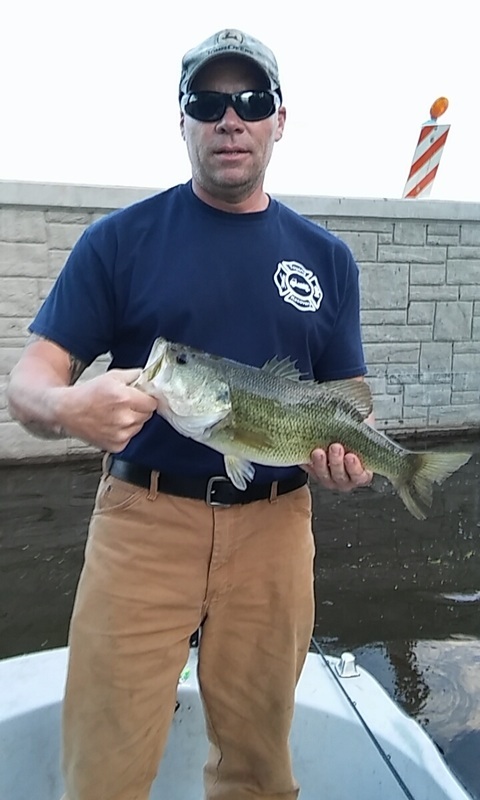 To ensure that other anglers can enjoy the thrill of catching these fish of a lifetime, please release them so one day we can have a state record fish right in our back yard. Mike Kalstrup's friend Ray Fontana went out on October 18th and caught this 50 inch Tiger Musky. Ray said he can now die a happy man. 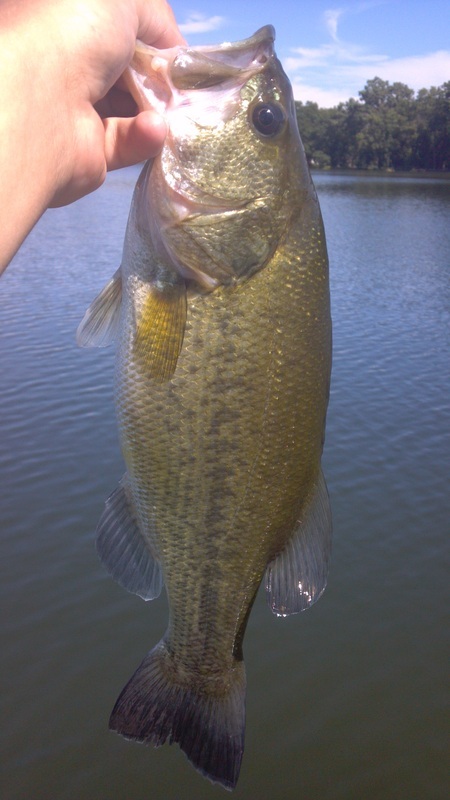 As always this fish was released per our lake fishing rules to fight another day. 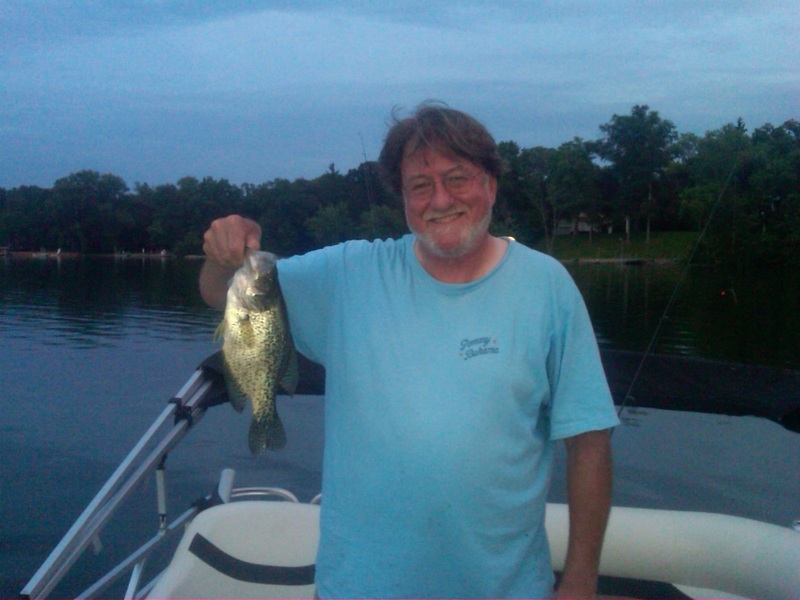 Here are some dandy Crappie, Walleye, Large Mouth Bass and a Northern caught during early September by Ron & Maggie Jensen and the legend Gary Secrest. 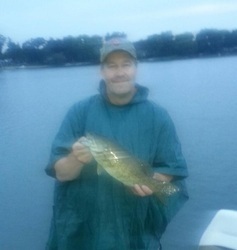 Guest Kevin Graham caught this nice 17 inch small mouth caught under the swimming pier off a worm and bobber. This fish was released to fight another day. Relatives and friends of Gary Secrest enjoyed some nice fishing on the lake over the past week. 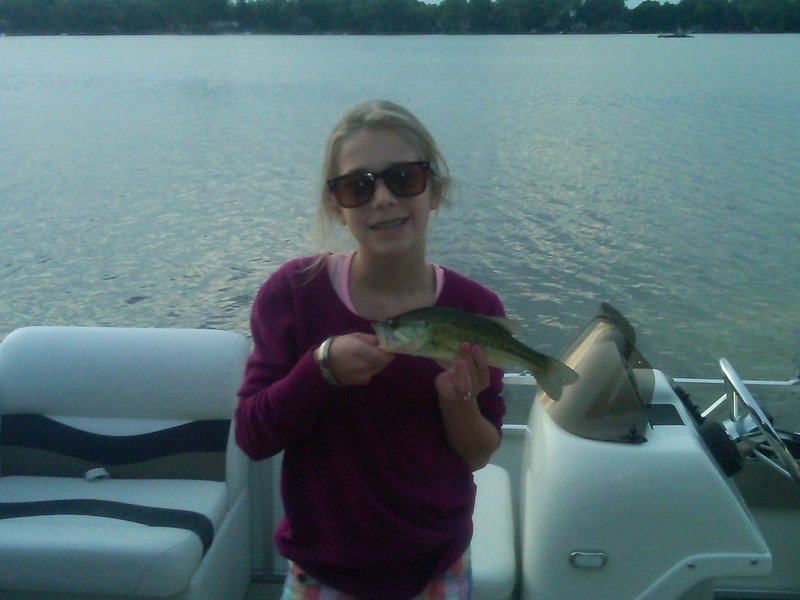 Here is a slide show on the many fish caught. All bass were released but a few of the crappie made it to the frying pan. Also note anglers are wearing life jackets. Always remember to wear them when you get out on the water. 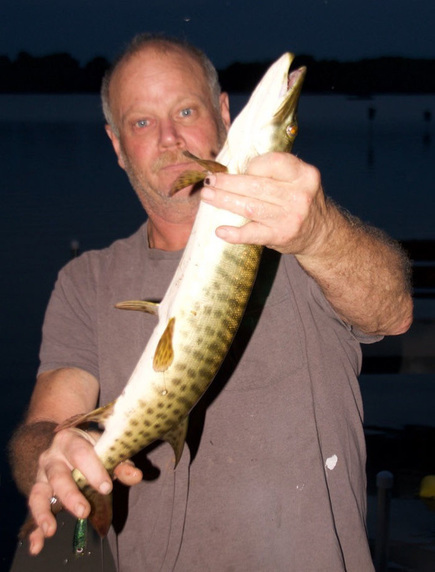 Long time friend of Marc Rosemeyer, Lenny caught this nice near 40 inch tiger musky. What a away to start a Sunday morning. 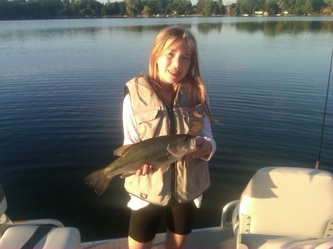 Best yet this fish was released per our Highland Lake fishing regulations. Strong fighting tiger musky around 48 inches caught and released by Justin Graham a friend of Alex Frank. 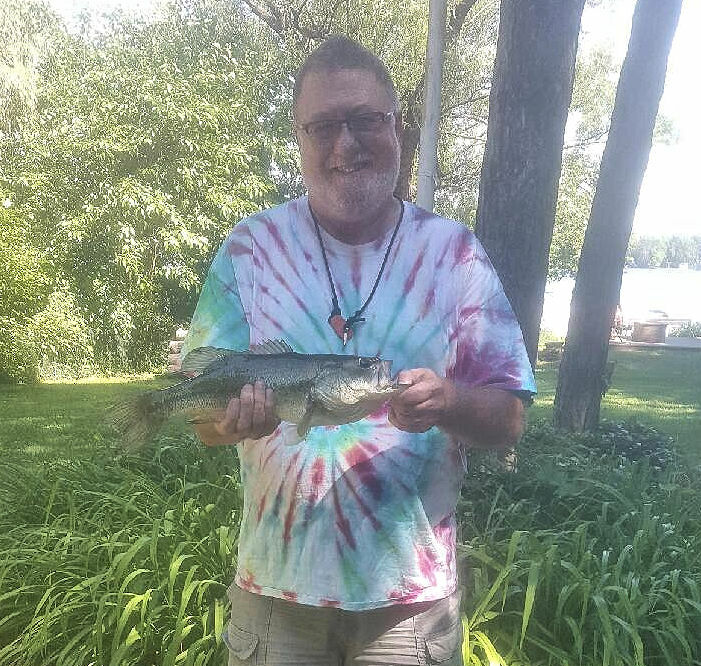 Nursing a hang over from the forth of July celebration Gary Secrest got wacky and caught this 17 inch bass from his pier. What a great remedy to take care of a hang over. This fish was released to fight again. June 12th Karl Heidecke a guest of Bob Smith caught this beautiful tiger musky (36inch 13lbs) off of Chic Park at lunch time. This fish was released after the picture. Way to go Karl. The morning bite of 3/10 turned out to be a thriller for Dan Rosemeyer. He caught this 41 Tiger musky on a tip up. He said this fish took off like a "Bat out of Hell". It gave him a great fight. 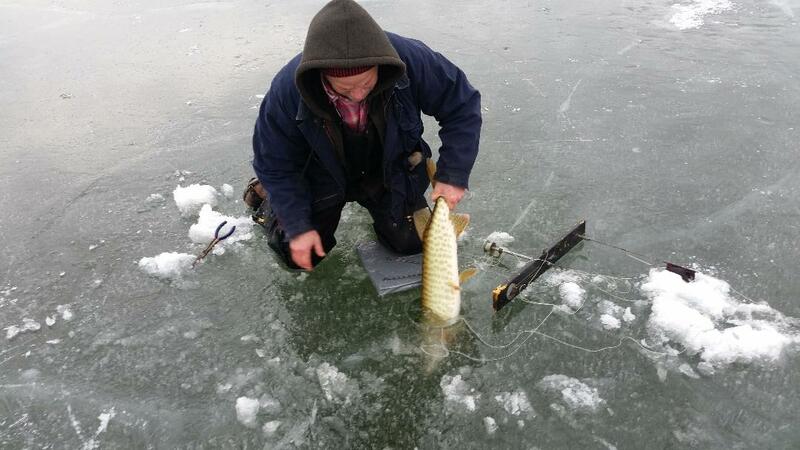 Most importantly Dan released the fish back into our lake about 30 seconds after the picture below. 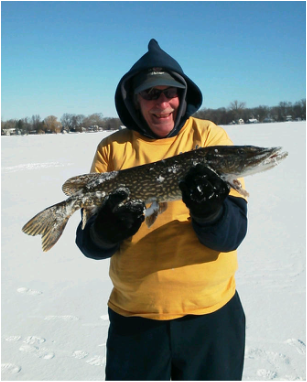 Karl Hedeike caught and released this 27 inch pike and Bob Smith (AKA God Bless) caught this 34 inch fish on 3/7/15. Dan Rosemeyer with a "24 inch Walleye Selfie" caught in his newly built shanty. Also see Dan in a blast from the past home made ATV that served him many years until sank to the depths of Round Lake. 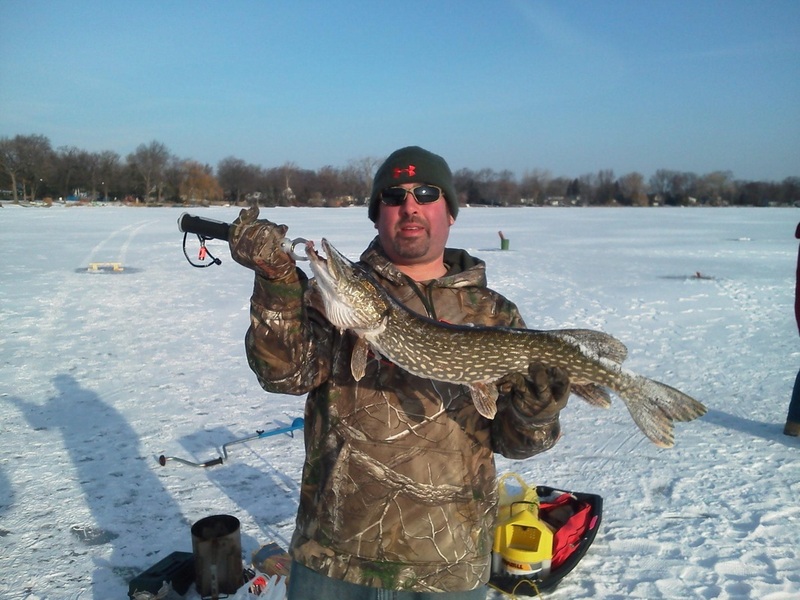 Karl Hedeike caught this 37 inch northern pike on 12/06/14 fishing off Chic Park. The ice he said was a scary 5 inches. The caught the fish in about 3 ft of water on a tip up. 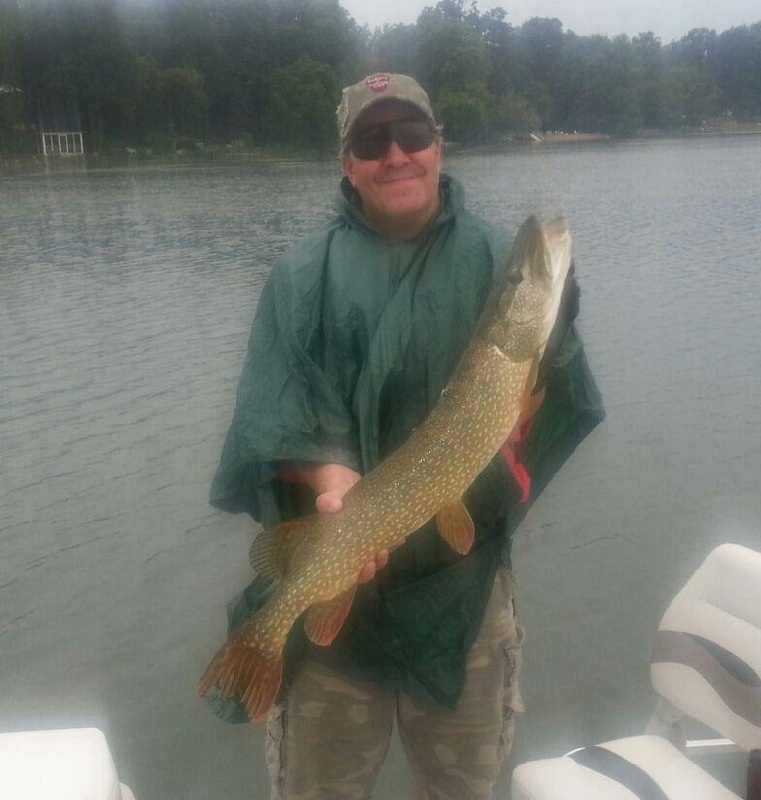 Ron Jensen knew it would be a good night fishing for musky on a rainy overcast night. But he did not catch any musky. Instead he caught this nice 35 inch northern on a glide bait and then this 17 inch smallmouth on a 8-inch black buck tail. Both fish were released. 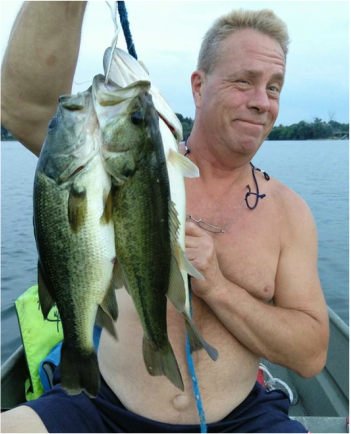 Gary Secrest caught these twin largemouth bass on a wacky worm while fishing with his son in law Josh.O. Both fish were released. Here are some great catches from Bill Henry's friends. Tyler caught a 13” smallmouth, Dan landed a 24” walleye. 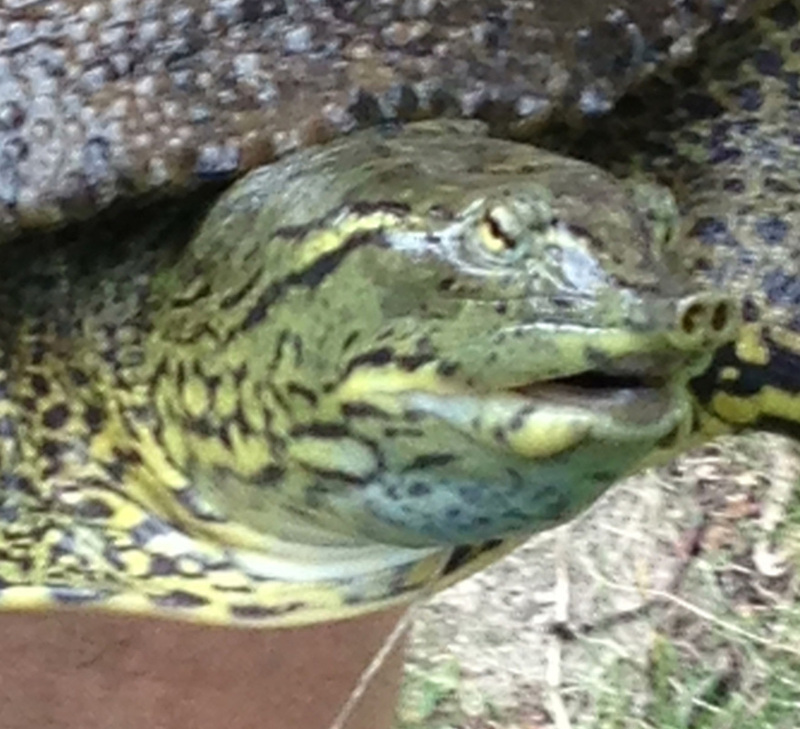 Also included is a picture of my friend Tom Anderson’s daughter Kaylee holding a soft shell turtle. All were caught off our pier using crawlers, and all were released. Click on the pictures to enlarge. 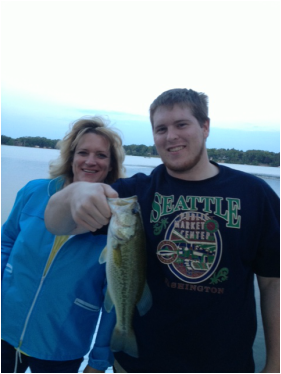 Michael Fraley along with his mother Karen Fraley holding a great Highland lake largemouth bass caught right off the Downey Lake Pier. Bill Henry's friend Jim ‘Lefty’ Bunker and his nephew Dan helped pitch-in this morning with the algae cleanup efforts at Downey park. 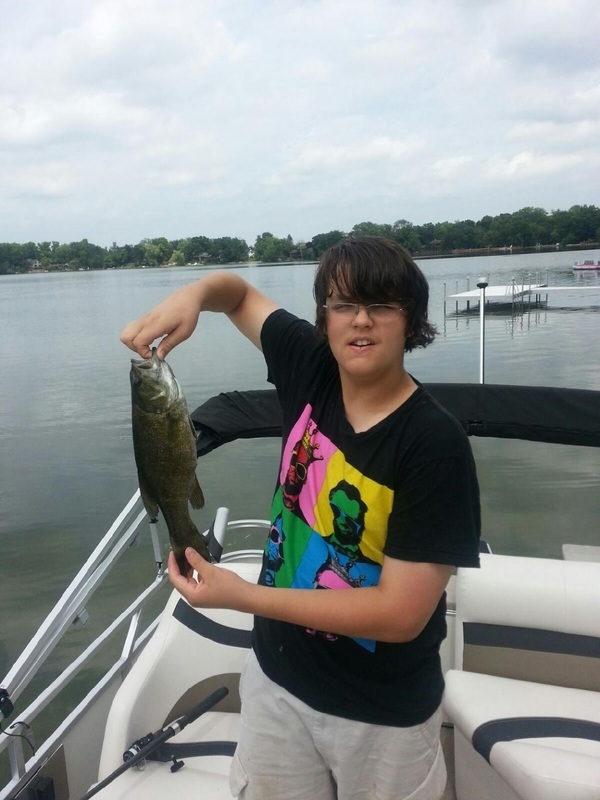 The lake rewarded Lefty later in the day with the illusive small mouth bass. 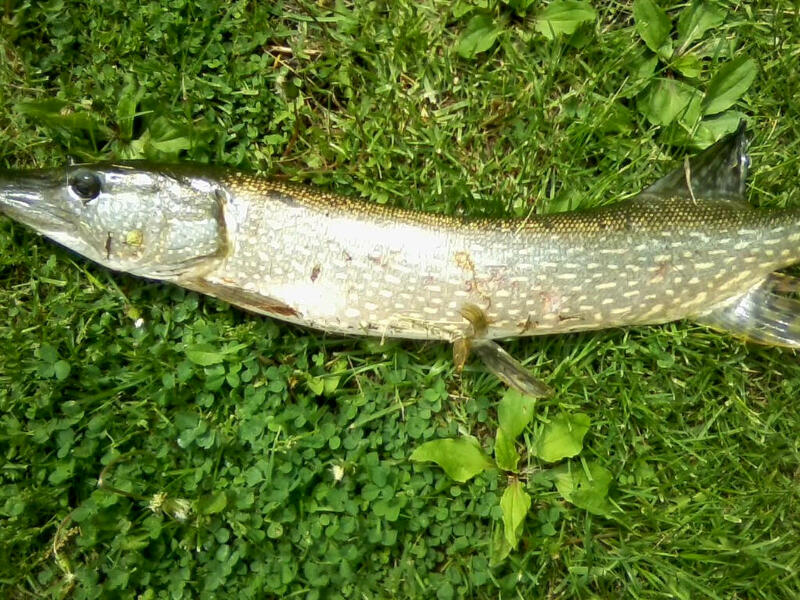 He caught this 17” beauty on a little bluegill that he caught prior. The small mouth was returned to the lake…the bluegill, not so much. Bill and company also caught two 24” catfish last night, and a 17” largie. Fishing is really great this summer! 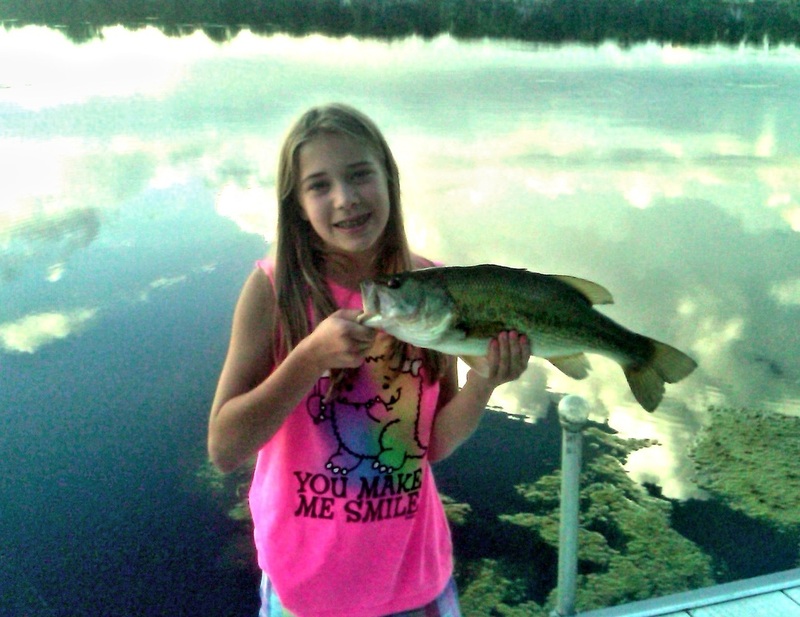 Maggie Jensen gets wacky again catching these two bass on the wacky worm. 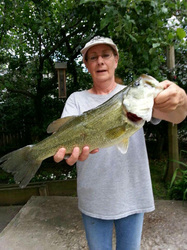 The big one (17 to 18 inches) was her biggest Large Mouth bass ever. Both fish were released to catch again. CeCe Heil has been really catching some nice fish this year after Carp Fest. 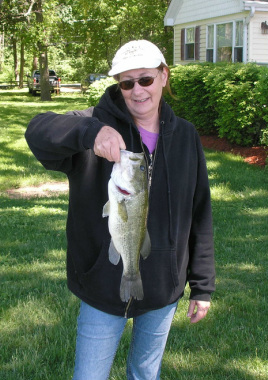 This month shes caught numerous 18 to 20 inch bass. 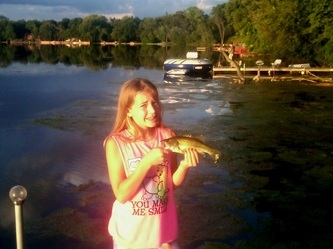 Topping her catch in the bass category was this 21 inch Large Mouth and a nice northern. All fish were released. This is part of our CPR program "Catch Photo & Release". Click on the pictures to enlarge. 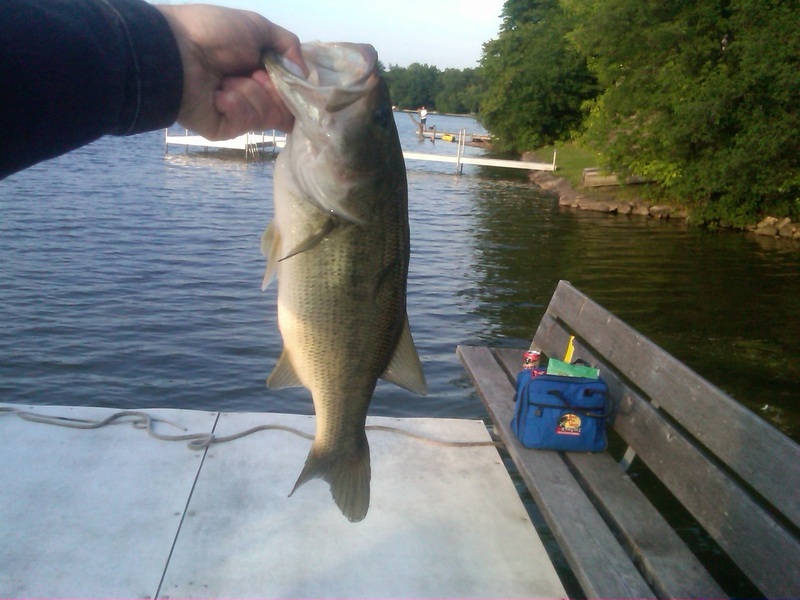 Lot of nice fish caught Fathers Day weekend on the lake. Jeffery Fraus caught a nice smallmouth on the top left. Maggie Jensen with several largemouth bass. Gary Secrest with a hog Crappie. 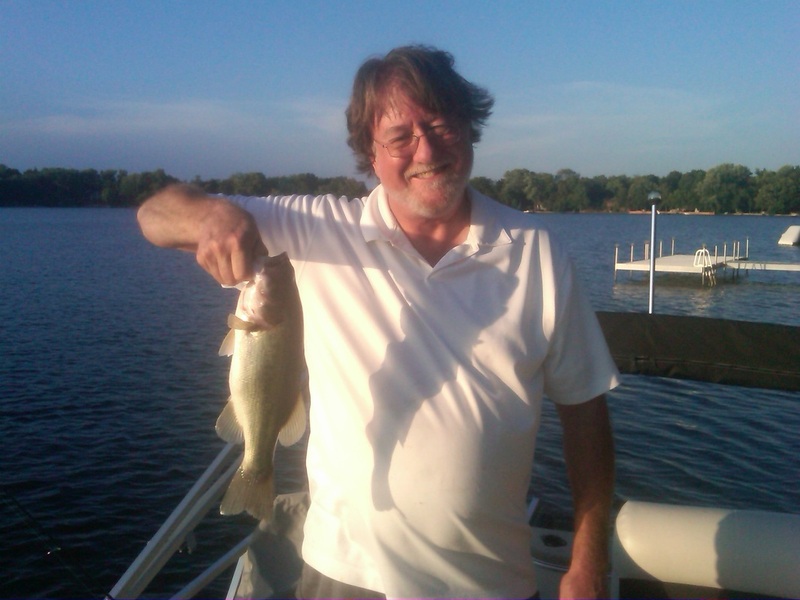 Ron Jensen holding several bass and a CCE (Catch Clean & Eat) walleye. These fish were all caught on wacky worms. Even the small blue gill wanted the wacky. When you fish with the wacky worm, wacky things happen. Click on the pictures to enlarge. 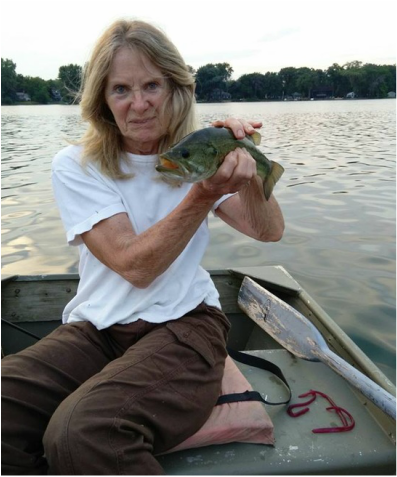 Gary's mom Claire Secrest enjoyed a nice day of fishing on Highland Lake. 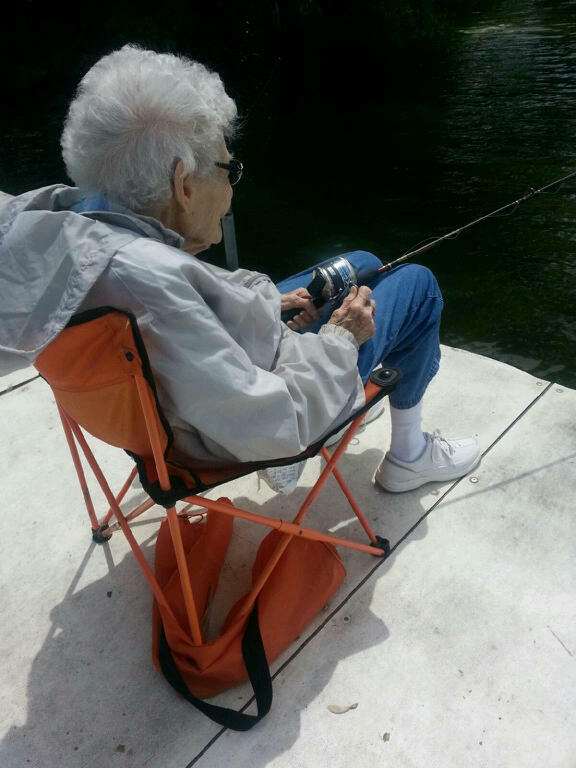 She is 96 years young and always want's to fish when shes out at his house. 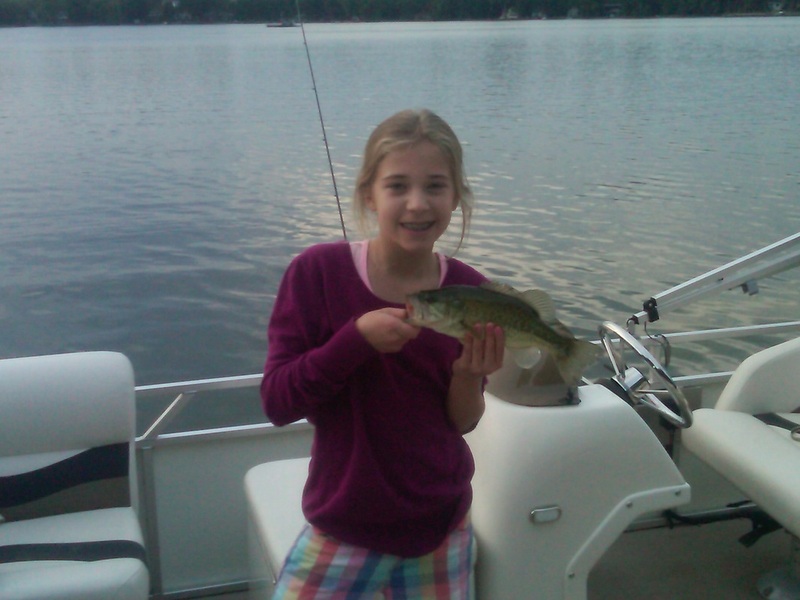 She caught 6 bluegills in her short time out. CeCe Heil caught this nice 18 inch large mouth bass on a worm while fishing during Carp Fest. This fish was released to fight another day. 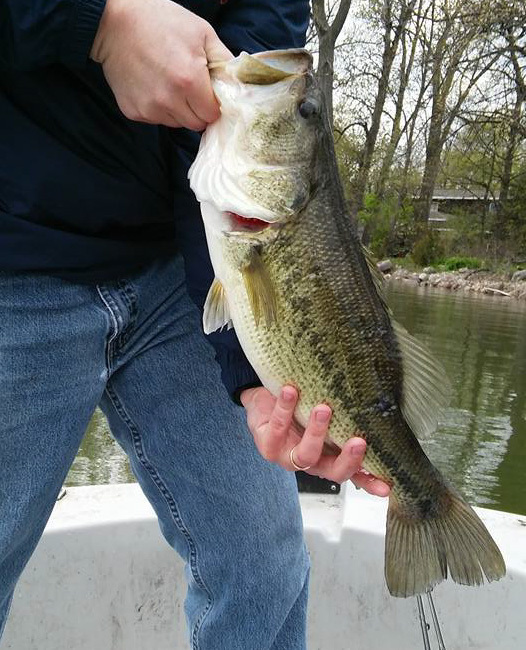 This nice, fat 16” largemouth bass was caught using a gold blade bait on May 4th by Dan Bunker. It seems that the fishing Gods smiled on Dan, after helping to re-install the Henry’s pier! 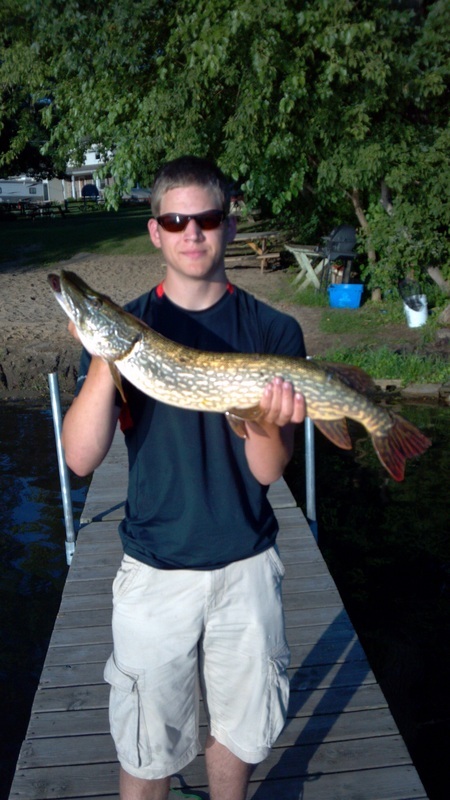 Young Bob Smith looking very happy at the nice 26 inch pike he caught on March 3rd on a tip up. However he's so focused on fishing Carp Fest this year when he pulled the fish out of the hole, he said "I didn't know carp had teeth". 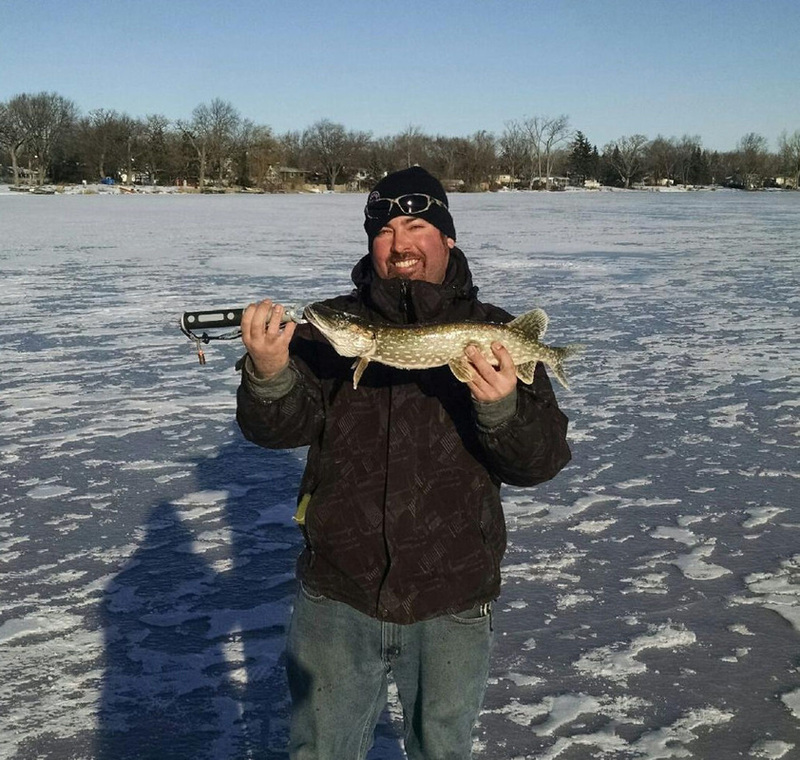 Karl Heidieke caught this nice 27 inch northern on a tip up. The fish was released to fight another day. Way to go Karl! Karl Heidieke guest of Bob Smith AKA "God Bless" took to the lake on 1/27 and caught three pike in the morning hours off of Chic Park. These were all caught on tip ups with golden roaches. Karl took the largest fish over 30 inches for dinner. 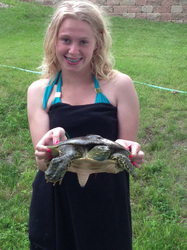 The other two were released. Please help the HLPOA keep the fishing report up to date by sharing your photos of your recently caught fish along with your name and a brief explanation of how you caught it. Click Here.